Anyone who has been into Waitrose in the last couple of days can't help but have noticed the large painting inside the entrance on the left. Indeed it seems to have gained such fame in such a short time that I overheard people in Central Road this afternoon being reminded to go and have a quick look before going home. 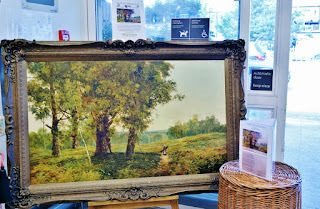 The painting is by Theodore Hines (1859-1922), a London based, specialist landscape painter, who exhibited at the Royal Academy and major galleries of the late Victorian era (this was confirmed by Bonham's 19th Century Paintings Specialist, Sam Travers). It was discovered by local resident and some time community activist Richard Johnson who managed to win it at auction in order to 'bring it home' to Worcester Park. 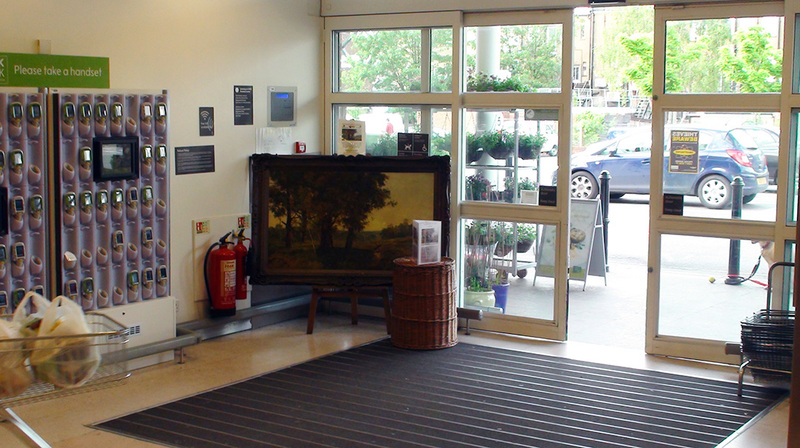 Waitrose's Worcester Park Branch Manager, Simon Cuzner has kindly agreed to put the painting on display in store. 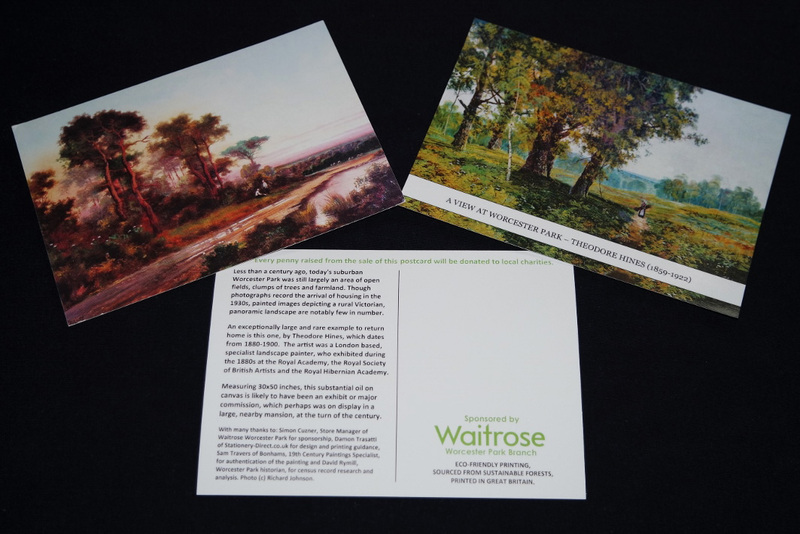 And very generously, Waitrose have agreed to pay for the commissioning of a postcard reproduction of the painting. The postcards are on sale for £1, with all the money raised going to charity - being equally divided among three charities assisting members of the Worcester Park community. The three charities are: Princess Alice Hospice (based in Esher), The Children's Trust (based in Tadworth) & Queen Elizabeth's Foundation for Disabled People (based in Banstead). Meanwhile, the postcards themselves are printed in Great Britain, while the materials are eco-friendly and sourced from sustainable forests. "Given the impressive dimensions, I’m pretty sure this oil painting will prove to be a unique record. With Waitrose having invested in the postcards, allowing every penny from the postcard sales going to charity, and with the postcards themselves being both printed in Great Britain and eco-friendly/responsibly resourced from sustainable forests, I am hopeful that sales will go well and hopefully appeal to virtually everyone! If you've ever wondered what Worcester Park looked like, as a park, before our houses arrived, here's the answer! 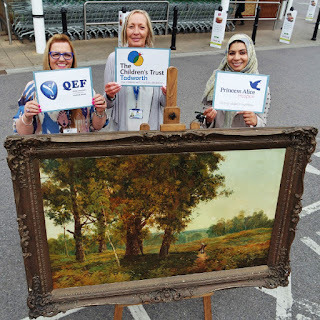 Buy a postcard and help the economy, the environment and three wonderful charities, helping members of our own community." The one area of doubt about this painting is pinpointing precisely where this (probably rather changed since) scene is. Some viewers have suggested it looks towards the southwest, possibly from Old Malden or Cuddington towards Ewell, Tolworth or what is now Stoneleigh (but wasn't then). In the background, you can just make out some buildings, and one appears to have a tower which might be a church? What do readers think? After displaying it in Waitrose, Richard would like to have it on display in Kingston Museum and is talking to Cllr. Mary Clark (representing the Old Malden ward part of Worcester Park) who is now deputy Mayor of Kingston about the possibility.